Enhance your décor with these handcrafted bonsai stands. Each stand is hand carved by Chinese artisans and hand finished with a stain that gives the piece a rich luster while protecting the wood for a long-lasting finish. The quality hardwood construction of these bonsai display tables brings character to your home, an ideal way to display personal treasures in an elegant way. The bonsai stand is an element of formality and will add to the decor of a room. They come in many different designs, shapes and sizes to fit your needs and are crafted to draw attention to the bonsai, not necessarily to the stand. 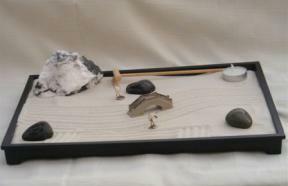 Stands are also used when displaying your bonsai in a ‘Tokonoma’ arrangement. 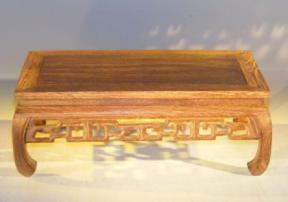 Wooden display table. Made in China with Semi-gloss finish. 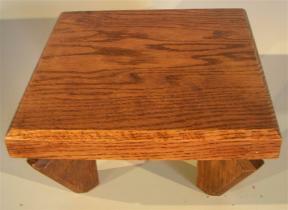 Wooden display table made from solid oak with angled legs. Made in America with semi-gloss finish. 14.5" x 10.5" x 1.0"
12" x 8.5" x 1.0"